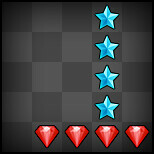 Match Maker may look similar to other jewel games, but it's very different! First, you'll join a room that holds up to four other players. Each player has their own board. 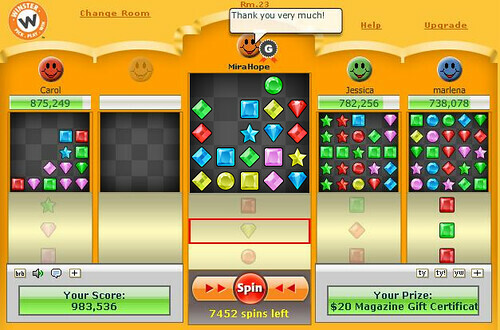 Click "Spin" to fill your board with gems! 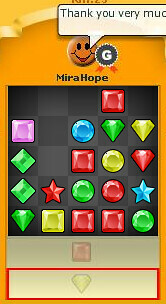 There are five gem shapes and five gem colors, which combine to create 25 different gems! 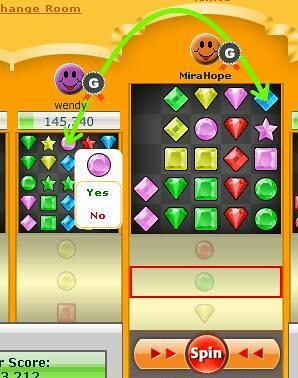 Whenever you get 3-5 gems of the same color and shape into a row or column, the gems will automatically disappear and any gems above the gap will fall into place! No new gems will appear until you clear your board, so work carefully! Move gems around by clicking on them and dragging them to new spots. If you drag a gem to a spot that already has a gem, the two will switch places! 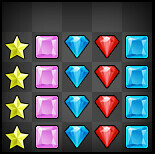 Unlike other jewel games, in Match Maker you can switch any gems on your board. They don't have to be near each other at all! When you get down to two (or less) gems on the board, the game considers your board "cleared." 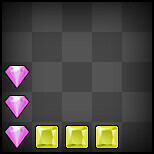 The remaining gems will vanish and you'll pick up five bonus points! To start a new board just click "Spin." Clicking "Spin" gives you completely new gems, but they're always in the same pattern of what you had left. If the board is empty, you'll get all new gems. If there are any gems left at all, clicking "Spin" will replace those gems with new ones. Like this! As a general rule of thumb, don't click "Spin" until you've made every match possible and traded all that you can. What? You don't know how to trade? Well relax, because trading is easy! Click on a gem on your board that you want to trade away and drag it to a gem on a teammate's board that you want in return. They'll see a Yes/No balloon pop up with a picture of the gem that you're offering. If they click "Yes" the gems will switch places! On the other hand, if someone offers you a trade then you'll see the Yes/No balloon pop up with a picture of the gem they're offering. Easy-peasy! 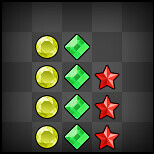 In Match Maker you get more points for bigger matches, and admittedly, sometimes that gets a little confusing. Just remember that a match is any group of gems that vanish at the same time. 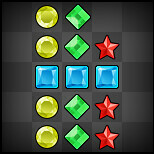 You can create chains where one group of gems triggers another group to vanish, but the game will count them as separate matches. Now, there are three levels of matches: Basic, Advanced, and Pro. 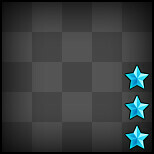 You can make whatever type of matches you like, but you'll get more points for trickier matches! Let's start with the Basic matches. 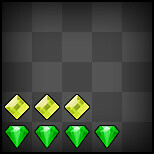 For these you only need to focus on one type of gem. It can be any type, of course. Oh, and don't forget that Club Winster members get four times the points! Basic matches are the foundation of Advanced and Pro matches. 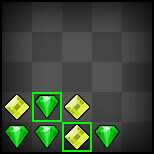 Remember, whenever gems are in a line of 3+ they'll automatically cash in and disappear! To make the 4-5 gem matches you'll need to keep the gems spaced apart in groups of two. 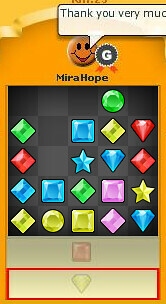 Place the final gem to connect them together and make a match! Advanced matches take a little more thought. 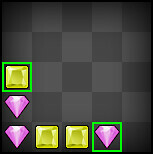 For these you'll need to work with two gem types and make both groups vanish at the same time. 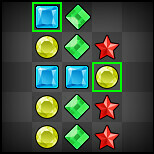 An easy way to do this is to use one gem from each group to block the other, and then switch the two gems to set off both groups. 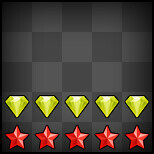 In the pictures below you'll see examples of how to make matches of 6-10 gems. 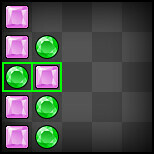 The first picture shows the layout, with the key gems highlighted in green. 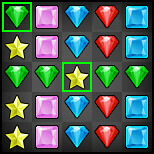 The second picture shows what happens after you switch the two highlighted gems. There are many different ways to make Advanced matches! The pictures are just to give you an idea of what's possible. Making any matches above 10 requires more effort. The only way to do it is to use an unfinished horizontal 3-5 match to keep other matches apart. There's a reason that these are Pro matches! Here's how you might create a match 11. 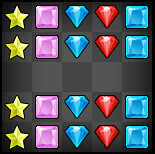 Now the three blue gems will vanish and the gems above them will fall down. 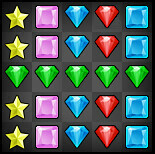 All of the remaining gems create a match at the same time, which makes this a match 11. Use the same principles to make bigger matches! The biggest match you can make is 20, and you can check the Tips & Tricks section to learn how to make it! Here are all of the points for Pro matches. To really succeed in Match Maker you need to trade. Clicking "Spin" resets the entire board, so look to your teammates for help! When you join a room and hit "Spin" for the first time, wait to see if anyone needs your gems before you start moving things around. If you help others complete what they're working on, they'll be able to spin and get new pieces to help you make your own big match! Sometimes you and your teammates might get stuck. Most players want to build big matches, but as we just discussed, that can only be done through trade. What happens when all of you are waiting for new gems but no one wants to spin and lose what they have? Well, you can hop rooms! Click the "Change Room" link near the top and you'll move to a new room with new players! Club Winster members can actually choose what room they want, or create a private room for friends! 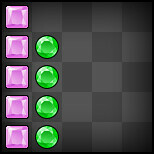 With a new pool of gems you can (hopefully) find the gems that you need. If you still need more gems, hop again! If you've made a new friend and don't want to lose them in the hop, mouse over their name and click "Friend." This will invite them to be your friend. If they accept you'll be able to see what room they're in! The biggest match you can make is a 20. It may seem crazy, but once you understand how it's done it will all make sense! Essentially, you use an unfinished horizontal match 5 to hold apart four vertical match 4s. Here are step-by-step instructions on how to do this! Setting up the pattern is the hardest part. 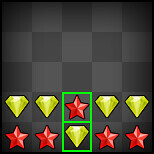 Start by making a line of gems in the middle to separate the upper and lower halves. 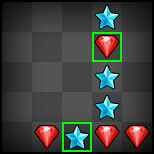 Reserve the center gem in another line and use a gem from that line to hold the middle. The middle line vanishes, and the gems above it will fall. 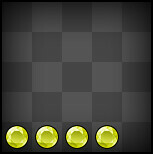 The last gems vanish and you'll pick up 5 points for clearing the board. 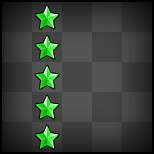 Altogether this pattern is worth 97 points. If you're a Club Winster member you'll get 388 points! 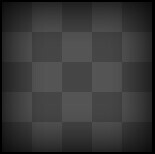 If you're having trouble remembering how to make this pattern, think of the match 5 as a belt that goes across the board. It's a defining line that keeps shirt (top half) and pants (bottom half) where they're supposed to be. It's also the only match 5 in the pattern! 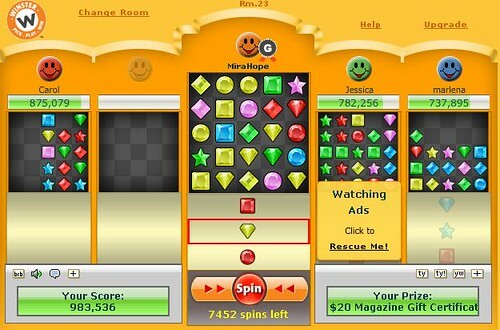 It can be frustrating to see a new player come in and spin their board over and over again! Your best bet is to direct them to this guide, and try find out if they have any questions. Once upon a time you didn't know how to play Match Maker either! Remember your own newness and have compassion for someone trying to understand it all. You?ve learned all there is to know about Match Maker. Be bold and go test your new skills!